Naval Air Station Oceana-Dam Neck Annex is located in Virginia Beach along a 4-mile stretch of beachfront property. The beach stability has been compromised with storms such as Hurricane Isabel. Buffer and training sites, as well as sensitive ecological habitat areas, have been degraded. The National Aquarium is partnering with the Naval Facilities Engineering Command Mid-Atlantic (NAVFAC MIDLANT), PWD Oceana Environmental Program Division (NAVYFAC ML-PWD Oceana EV) Command, and the Virginia Aquarium and Marine Science Center to restore habitat for local wildlife and protect the shoreline. 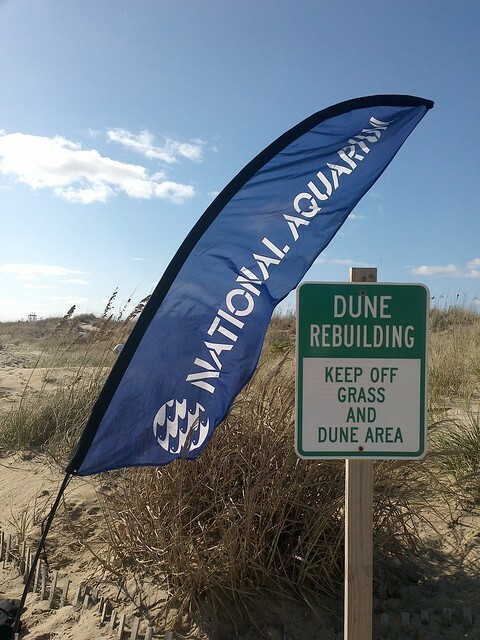 Due to storm activity, dune fencing needed to be installed to facilitate natural dune formation, and grasses planted to stabilize the area. Coastal sand dunes are formed by the action of sea and wind. Material carried by the rivers is deposited with the help of the sea along the coastline, forming sand dunes. They protect the land by acting as a natural barrier to salt water intrusion and sea wind erosion. The sand dune system absorbs the energy of the waves; without this protection, soft coastline would disappear rapidly. Even small disruptions in the dune system can cause saltwater infiltration into the ground water, threatening local farmlands. Although sand dunes may appear to be lifeless, in reality they are home to a multitude of species. Their importance has been acknowledged over the last few years, and they are now priority habitats for conservation.